As expected, the Yankees broke the single-season home run record last season. It’s usually silly to say a team or a player is expected to break a record, especially a home run record, but once the Giancarlo Stanton trade went down, the expectation was the Yankees would at least challenge the homer record, if not break it. Break it they did. Single-season record with 267 home runs, three more than the 1997 Mariners. Most players with double-digit homers (12!). First team to get 20+ homers from all nine lineup spots. That last bullet point is insane. Insane. The Yankees did not set the home run record because one or two (or three) players had historic power seasons. Stanton led the team with 38 homers and no one else had more than 27. The Yankees set the record with a deep power attack. They could hit the ball out of the park one through nine. Aaron Judge missing seven weeks with a wrist injury (and being ineffective thereafter). Gary Sanchez missing two months with groin injuries (and being pretty bad when healthy). Giancarlo Stanton having what qualifies as a down season compared to the rest of his career. Gleyber Torres spending most of April in Triple-A. The health qualifier is a big one. We know the Yankees won’t make it through 2019 healthy — Gregorius is already hurt and Aaron Hicks is nursing a back issue — because no team makes it through the season healthy. Injuries are part of the game. The teams that best replace injured players are the teams that usually find themselves in October. That all said, the Yankees should hit a lot of home runs even when they deal with injuries. Look at last season. Judge and Sanchez combined to play 76 fewer games and hit 40 fewer home runs in 2018 than 2017, yet the Yankees still set the record. This team is not reliant on one or two players. That’s what makes them so dangerous. It’s a deep offense. … but last year is the outlier. The ongoing narrative that you can’t hit home runs in the postseason doesn’t jibe with the numbers, yet it persists. Whatever. Hitting a homer is the single best thing a hitter can do in any at-bat and last year the Yankees did it better than anyone. There’s reason to believe they’ll do it better than anyone this year as well. Obviously the goal is to win games and the World Series, not set home run records, but one contributes to the other. Hit a lot of home runs and you’re going to win a lot of games. With good health, the Yankees very well might shatter last year’s home run record. Even with the usual slate of injuries, they still have a chance to dethrone last year’s record-setting offense. On the eve of pitchers and catchers reporting, there is one thing we know with absolute certainty about the 2019 Yankees: Their projected starting lineup will be very right-handed. With Didi Gregorius injured Aaron Hicks is far and away the club’s best left-handed threat, and he’s a switch-hitter. Brett Gardner can still grind out an at-bat like nobody’s business, but an offensive linchpin he is not. Four years ago the Yankees were very left-handed and we all complained they were too prone to infield shifts. Now the Yankees are very right-handed and the complaint is, uh, they strike out too much? The strikeout issues aren’t as bad as you may think — the Yankees had a 22.7% strikeout rate as a team last year, just above the 22.3% league average — but we need something to complain about, I guess. “Hopefully we can get some balance with a more fluid offense that can score a lot of different ways,” Brian Cashman said during his end-of-season press conference and adding balance is not what happened this winter. The Yankees replaced Gregorius with the righty hitting Troy Tulowitzki and essentially replaced the switch-hitting Neil Walker with the righty hitting DJ LeMahieu. Also, Luke Voit is poised to fully replace Greg Bird at first base. Last year the Yankees took nearly two-thirds of their plate appearances right-handed and, with Gregorius sidelined and Voit pushing Bird out of the picture, it’s possible they’ll take even more plate appearances right-handed this year. It is very un-Yankee-like. The franchise’s history is littered with patient and powerful left-handed batters and the new Yankee Stadium is tailor-made for lefties. That right field short porch is begging to peppered with fly balls. Being so right-handed is not necessarily a detriment. The 2017 World Series champion Astros took 64.7% of their regular season plate appearances right-handed, for example. They pulled it off because they didn’t just have a lot of right-handed hitters. They had a lot of great right-handed hitters. Jose Altuve, Carlos Correa, George Springer, so on and so forth. The Yankees are cut from a similar cloth with Aaron Judge, Giancarlo Stanton, Gleyber Torres, etc. The Yankees were actually quite a bit better against righties (115 wRC+) than lefties (102 wRC+) last season, which is not what I would’ve guessed. We can’t chalk that up to small sample size noise either. The Yankees collectively had over 2,300 plate appearances against southpaws last season. I guess it’s just one of those things. I know if I were a lefty pitcher, I wouldn’t want to face the Yankees. I wouldn’t want to face them as a righty either, but I digress.
? … and Sergio Romo getting some key right-on-right outs with that frisbee slider in the late innings for the Rays. Overall, the Yankees were really good against righties last season. There were still times when a little more balance would’ve been nice, the same way a little more balance would’ve been nice when the Yankees were so left-handed in 2015. Same idea, different sides of the plate. * Fun Fact: The Yankees won that game thanks to this. Cashman and the Yankees had literally an entire offseason to add left-handed balance to their lineup and they instead doubled down on righties with Tulowitzki and LeMahieu. Michael Brantley, Daniel Murphy, and Jed Lowrie were all out there ready to add lefty thump to the lineup, but the Yankees passed. Bryce Harper and switch-hitter Marwin Gonzalez are still out there, yet the Yankees are showing essentially zero interest. The Yankees viewed LeMahieu as the second-best free-agent infielder behind Manny Machado, ranking him ahead of Marwin Gonzalez, Jed Lowrie and the rest. LeMahieu, in the club’s opinion, offers elite defense and superior makeup, and some of the team’s internal data suggested he was under-valued offensively. The Yankees didn’t ignore the lack of lefties because they’re dumb or oblivious. They just don’t value lineup balance much. Overall talent and expected production trumps handedness. The same applies to the pitching staff. Three lefty starters were acquired this offseason (J.A. Happ, James Paxton, CC Sabathia). Why? Because they were the best available players at their price points (which is another topic for another time). Not because they’re lefties. The righty bats are really good. It’s one thing to stack your lineup with righties like late career Vernon Wells and Kevin Youkilis, Eduardo Nunez, and Ben Francisco. It’s another to do it with Judge, Stanton, Torres, Andujar, and Gary Sanchez. Most of the righty bats are young. Tulowitzki is 34 and LeMahieu is 30. They’re the exceptions. Stanton is 29, Judge and Sanchez are 26, Andujar is 23, and Torres is 22. Age-related decline is not a concern with these righty hitters. Personnel changes during the season because that’s baseball. Who had Andrew McCutchen and Luke Voit hitting first and fifth, respectively, in the Wild Card Game at this time last year? You can add Sir Didi’s eventual return here, giving the Yankees another lefty bat, though I’m inclined to treat anything Gregorius gives the team this year as a bonus. He is expected back at some point and that’s great. After a major procedure like Tommy John surgery, I prefer to prepare for the worst. Gregorius will probably hit the ground running when he returns. There is a chance he won’t though. In a perfect world the Yankees would sign Harper and plop him into the middle of the lineup, mostly because he’s a very dangerous hitter and partly because he’s a lefty. That’s probably not going to happen, unfortunately. Greg Bird staying healthy and remembering how to hit would help balance the lineup, but, given his recent track record, it’s impossible to count on that. What you see is what you get with the lineup right now. A righty heavy lineup is not inherently a bad thing. Again, the Astros won the World Series two years ago with a ton of righties. It can work. The Yankees have prioritized talent over handedness, and as the season plays out, they’ll have a chance to adjust the lineup as necessary. My guess is the right-handed heavy lineup will be one of those things that is discussed as a potential issue all season but is never actually a significant problem, kinda like last year. Barring a surprise Manny Machado or Bryce Harper signing — either would qualify as a big surprise to me at this point — the 2019 Yankees are pretty much set on the position player side. They do have to figure out their bench, and the DH spot will be something of a revolving door, but the nine starters are in place. The Troy Tulowitzki signing addressed the middle infield opening and that was the last remaining position player question. That’s it, right? Right. I suspect Stanton will see more time in left field next year as Gardner’s playing time is scaled back — at the very least, Gardner should sit against lefties going forward — but that’s the starting nine most days. Pretty good squad, I’d say. FanGraphs projects that crew to average 5.03 runs per game in 2019, second most in baseball. What we don’t know is how Aaron Boone will fill out his lineup card. Judge will probably hit second and Stanton will probably hit third or fourth. That’s about all we know for sure. And, frankly, I’m not sure there’s a wrong answer for the rest of the lineup because the Yankees have so many good hitters. Gardner and Tulowitzki are the clear weak links. Everyone else is pretty dangerous in the batter’s box. The leadoff spot is a bigger question now than it has been at any point in the last four or five years because Gardner has declined. From 2013-18, it was plug Gardner into the leadoff spot and watch him grind away. Now, after a .236/.322/.368 (90 wRC+) line last season, and a .209/.288/.316 (66 wRC+) line in the second half, Gardner in the leadoff spot is no sure thing. Even against righties (95 wRC+). Andrew McCutchen took over the leadoff spot late last year and he did the job very well. McCutchen’s gone now though. The Yankees have to again figure out the leadoff spot and there’s a chance they won’t get it right the first time, and will have to adjust on the fly. It happens. Lineups are ever-changing. I see four leadoff candidates on the roster. Yup. Just put Gardner back in the leadoff spot and see what happens. Perhaps he’ll rebound following an offseason of rest and put up a solid season, or even just a solid first half. If nothing else, you know Gardner will grind out at-bats and see a lot of pitches. He saw 4.24 pitches per plate appearances last season, tied with McCutchen for the ninth most in baseball. Gardner still runs the bases really well too. He went 16-for-18 stealing bases with a 54% extra-base taken rate, far better than the 40% league average. Given the current roster, giving Gardner one last crack at the leadoff spot is an option. Yeah, Hicks is probably most qualified to be the leadoff hitter this coming season. He gets on base (.366 OBP in 2018), he sees a ton of pitches (4.28 per plate appearances), he can run (11-for-13 in steals and 54% extra-base taken rate), he switch-hits, and he has power. Teams are all about power hitters atop the lineup these days. Francisco Lindor (38 homers), Matt Carpenter (36 homers), and Mookie Betts (32 homers) were all primary leadoff hitters last year. Charlie Blackmon set a new MLB record with 37 homers as a leadoff hitter in 2017. The downside here is Hicks is the team’s best (only) left-handed threat at the plate and you know the Yankees want to split Judge and Stanton up. I wish they’d just bat them back-to-back but, clearly, the Yankees want to split them up with a lefty whenever possible. With Didi Gregorius sidelined, Hicks is the obvious candidate to hit third between Judge and Stanton. That’s where he hit in the postseason, remember. Are the Yankees willing to bat Judge and Stanton back-to-back, or squeeze another righty between them? If no, Hicks probably gets the nod as the third place hitter. Now we’re talking. Torres put up a .271/.340/.480 (120 wRC+) batting line last season that is impressive for any player. It is especially impressive for a 21-year-old middle infielder thrust into a postseason race in New York. Torres had a lot of hype to live up to last season and he certainly did it. In year two as a big leaguer, Gleyber could take another step forward and become a legitimate top of the order threat. Would be cool. This much we know: Torres got on base at a good rate last season (.340 OBP), he saw lots of pitches (4.03 per plate appearance), and he has some of that new school leadoff power. The one traditional leadoff skill Torres lacks is baserunning. He’s a crummy baserunner. If he gets on base and creates enough havoc from the leadoff spot though, you can overlook some bad baserunning. Gleyber’s skills suggest last year’s on-base ability and power is no fluke. He can do it again, and even improve on it with experience. Why the hell not? Boone flirted with batting Judge leadoff against lefties last season. He never went through with it but he did talk about it. At this time last season we didn’t know Torres and Andujar would do what they did and give the Yankees that extra lineup length. Judge’s power in the leadoff spot didn’t make much sense at the time. He was needed in a more traditional run-producing spot. That’s it. Two teams in baseball history have done it. And — and! — all five guys who hit 27 homers for the Yankees could do it again. Hicks and Stanton were the oldest 27-homer guys at 28. Maybe they don’t all hit 27+ homers again. Point is, the Yankees have a lot of power in their lineup, so much so that moving Judge to leadoff is a more viable option. Going into last year, they needed his power in the middle of the lineup. Not so much now. We have two years of evidence telling us Judge is an elite on-base player. He did lose 30 OBP points from 2017-18, but we’re talking about going from a .422 OBP to a still excellent .392 OBP. Judge draws a ton of walks (career 16.7%) and every time you look up he’s in a 3-2 count. Those are the type of at-bats you want from a leadoff hitter. Add in the power and a league average extra-base taken rate, and you’ve got a guy who is an instant threat at the plate to begin every game. I suppose that, if he shows some life with the bat, Tulowitzki could become a leadoff option at some point. I can’t imagine going into the season with him atop the lineup though. The Yankees will want to see some leadoff worthy production before moving Tulowitzki up high in the lineup, and not just in Spring Training either. Spring Training lies, man. Tulowitzki will have to produce in the regular season before getting a chance at leadoff. Signing Machado or Harper would change the leadoff equation considerably. Both would slot into the No. 3 lineup spot nicely between Judge and Stanton, freeing up Hicks for leadoff duty. Or, on the other hand, adding another middle of the order bat makes Judge at leadoff an even greater possibility. Anyway, this is begging for a poll, so let’s get to it. Who should hit leadoff in 2019? After seven weeks and 38 posts, our 2018 Season Review series finally comes to an end today. It was a good run. Time to put 2018 in the rear-view mirror and look ahead to 2019 and beyond. If you missed any of the season review posts, or simply want to check them out again, there’s a link in the sidebar. Anyway, there are still a few stray miscellaneous 2018 items I want to cover as part of the season review series, so we’re going to lump them together in this smorgasbord post. Here’s the last little bit of “what you need to know” from this past season. If you’re a fan of home runs — I sure am! — this was the season for you. 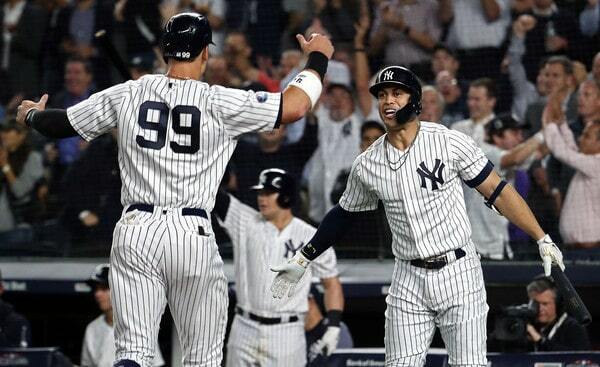 The Yankees set a new Major League record with 267 home runs this season, three more than the 1997 Mariners. They did that even though Aaron Judge missed seven weeks, Gary Sanchez missed two months (and was pretty bad when healthy), and Giancarlo Stanton had a down year. With a healthy Judge and a typical Stanton season, the Yankees might’ve hit 300 homers in 2018. Golly. The Yankees had neither a 40-homer guy nor multiple 30-homer guys. Stanton led the team with 38 homers. Judge, Miguel Andujar, Aaron Hicks, and Didi Gregorius all tied for second with 27 apiece. The Yankees did have 12 different players hit at least ten homers this year though. That’s a record. Also, 24 times a Yankee hit multiple home runs in a game in 2018. That ties the record. Twenty homers from each lineup spot is insane. Absolutely insane. That’s the attack the Yankees had this season. They didn’t have that one guy who had a monster season. They had a lot of guys who had really good seasons. I mean, 20 homers from each lineup spot? Twenty-five homers from each position? A dozen different players with double-digit homers? This was the Year of the Dinger and it was glorious. April 2nd vs. Rays: Made up the next day (home opener). April 14th at Tigers: Made up during a June 4th doubleheader. April 15th at Tigers: Made up during a June 4th doubleheader. May 15th at Nationals: Suspended after five innings and completed June 18th. May 16th at Nationals: Made up during the June 18th one-and-a-half-header. May 31st at Orioles: Made up during a July 9th doubleheader. June 3rd at Orioles: Made up during an August 25th doubleheader. July 22nd vs. Mets: Made up on August 13th. July 27th vs. Royals: Made up during a doubleheader the next day. September 18th vs. Red Sox: Game “postponed” from 1pm ET to 7pm ET. The September 18th game was officially “postponed” rather than “delayed” because a postponement allowed fans to exchange their tickets for the Yom Kippur game. Anyway, that is nine postponements (eight if you don’t count September 18th) plus one suspended game. This season the Yankees played four doubleheaders and one one-and-a-half-header to complete the suspended game, and they gave up four off-days to makeup dates. The Yankees went 5-5 in the nine makeup games plus the suspended game, by the way. Furthermore, the Yankees had to threaten to boycott ESPN to make their travel less hectic. ESPN flexed the July 8th game between the Yankees and Blue Jays into their 8pm ET Sunday Night Baseball slot. So the Yankees would’ve had to play in Toronto on Sunday night, then play a doubleheader in Baltimore on Monday. The doubleheader was scheduled long before ESPN flexed the game too. They knew about the doubleheader and tried to get the Yankees to play Sunday Night Baseball anyway. The Yankees said move the game or we’ll ignore your reporters and refuse to cut promos, and that took care of that. The fact they had to do that to get the game moved was ridiculous. The Yankees had some travel problems in addition to all the postponements this season too. After that May 16th rainout, the Yankees spent the night at Dulles International Airport due to the bad weather and a mechanical issue with the plane. They didn’t leave for Kansas City until the following morning. On May 23rd the Yankees left Dallas after a game with the Rangers but had to return to the airport shortly after takeoff due to mechanical problems. They didn’t takeoff for home until six hours later. And finally, on June 3rd, the Yankees were stuck on the tarmac for a while because of a radar issue. Sheesh. It takes some time for team performance to result in noticeable attendance and ratings changes. Those changes usually don’t show up until the next season, in fact. People aren’t out there saying “hey, the Yankees went 20-10 this month, let’s go buy a bunch of tickets” or anything like that. I mean, that does happen a little bit, but it takes some time to see a meaningful change in attendance and ratings. Last season’s winning and general excitement helped the Yankees increase attendance roughly 10% and draw more than 4,000 more fans per game in 2018 than 2017. It was their best attendance season since 2012 (3,542,406 total and 43,733 per game). The Yankees led the AL in attendance this year — they led the league in attendance every year from 2003-15 before slipping behind the Blue Jays in 2016-17 — and were second in MLB behind the Dodgers (3,875,500 total and 47,043 per game). What in the world is that? I kept looking at the outs box to see the pitcher’s pitch count. I’m a simple man. I have a 36-inch television and a cramped New York apartment. 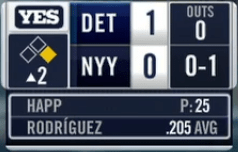 My couch isn’t that far from the television, but I constantly had to squint and strain my eyes to see the pitcher’s pitch count in that little box under the score bug. Oh, and that line with the pitch count? That’s where the pitch velocity shows up, so you have to strain your eyes to see that too. And what’s up with the batting average? I don’t need to see that. You showed it to me before the at-bat! I don’t need the constant reminder. To be fair, the batting average is replaced by the player’s game performance in subsequent at-bats. It’ll say he’s 1-for-1 or 0-for-4 or whatever, which is nice, but there’s no additional information (homer? walk? etc. ), and it’s still clutter. There’s too much to look at there. I’m not normally someone who complains about change. I am embrace change. New and interesting things happen all the time and I want to know all about them. This new score bug though? No. No no no. I applaud the folks at the YES Network for trying to improve the viewer’s experience. There’s just too much going on here and important information like the pitch count and velocity — stuff I look at after literally every pitch — is too difficult to read. The old score bug was fantastic. Simple, easy to read, didn’t take up much real estate. I miss it. As you’d expect with a team that won 100 games and went to the postseason, the Yankees pounded out several big hits this past season. Especially early in the year, when they went on that 17-1 run and seemed to come from behind in the late innings every game. You can’t win that many games without occasionally turning some high probability losses into wins. With that in mind, it’s time for our annual look back at the five biggest base hits of the Yankees’ season. To do so, we’re going to use Championship Probability Added, which is essentially Win Probability Added on steroids. WPA tells us how much closer a play gets you to an individual win. CPA tells us how much closer a play gets you to winning the World Series. Given the nature of the CPA, you shouldn’t be surprised to learn the team’s five biggest hits of the year came in the postseason. In fact, their 14 biggest hits of the year came in the postseason. Don’t worry, we’ll make some time for the clutchiest regular season hits later in the post. Let’s dig into the five biggest hits of the year according to CPA, shall we? The Yankees’ fifth biggest hit of the regular season left the yard. With the Yankees already leading 1-0, Gary Sanchez clobbered a long solo home run against David Price in the second inning of ALDS Game Two. Price left a cutter up just enough and Gary did not miss it. Sanchez’s career numbers against Price are absolutely silly. Including the postseason, he is 7-for-14 with six homers against Price. Four walks and only two strikeouts too. That’s a .500/.611/1.786 batting line. I usually don’t put too much stock into hitter vs. pitcher stats — I absolutely believe a hitter can “own” a pitcher and vice versa, though head-to-head numbers usually come in very few plate appearances, and it’s hard to know what’s legit and what’s noise — but man, when you’re 7-for-14 with six homers against a guy, I have to take notice. CPA: +0.009. One inning before Sanchez gave the Yankees a 2-0 lead in ALDS Game Two, it was Aaron Judge who gave the Yankees a 1-0 lead. That was homers in back-to-back at-bats for Judge dating back to the ninth inning of Game One. Price left a cutter out over the plate to Judge, and he walloped it over the Green Monster for a mighty no-doubt dinger. That was huge, obviously. Whenever you drop Game One of a postseason series — especially a best-of-five series — you want to come out right away and take it to ’em in Game Two. Respond right away and don’t give the other team a chance to feel confident. Perfect. Just perfect. I know Price got the postseason monkey off his back in the ALCS and World Series, but it’s still comforting to know the Yankees crush him. 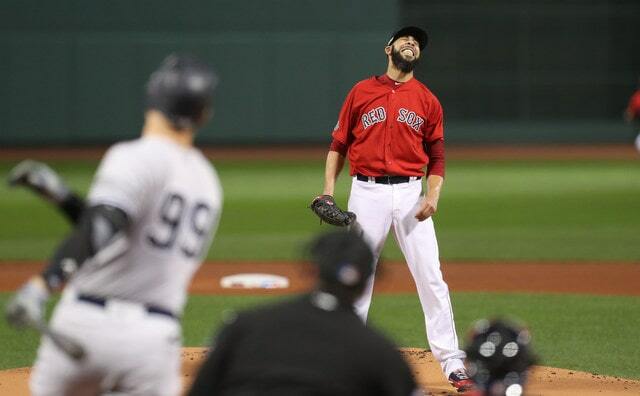 Including the postseason, Price allowed 23 runs and eleven homers in 17.1 innings against the Yankees this year, and that includes one start in which he allowed two runs in six innings. Goodness. CPA: +0.009. Right back to ALDS Game Two. It was a pretty important game, after all. Last game the Yankees won this season! Also the game that allowed them to tie the ALDS at a game apiece. That was the longest home run hit by a Yankee this season and it was also the last home run hit by a Yankee this season. Sanchez came oh so close to a walk-off grand slam in ALDS Game Four and instead had to settle for a sacrifice fly (video). That non-homer won’t necessarily haunt me this winter — haunt is too strong a word — but damn, every once in a while I think about it and it bums me out. I thought it was the big one. CPA: +0.011. Baseball is cruel. According to Championship Probably Added, the team’s second biggest hit of the season did not drive in a run. It wasn’t a walk-off hit or a game-tying hit or a screaming line drive or anything like that. The second biggest hit of the season was Didi Gregorius’ ground ball single in the ninth inning of ALDS Game Four. All it did (“all” it did) was bring the tying run to the plate with no outs in the final half-inning of the season. It proved to be the Yankees’ final hit of the season and also Didi’s final pre-Tommy John surgery hit. Like I said, baseball can be cruel. ?? That dinky little single put two men on base with no outs. Judge drew a four-pitch walk to start the frame and, later in the inning, Luke Voit drew a walk to load the bases and Neil Walker took a pitch to the foot to force in a run. That’s when Sanchez hit his high non-homer. Sigh. CPA: +0.011. The Yankees played five elimination games last postseason and went 4-1. The four wins were nice, but, ultimately, the one loss is the only thing that really counts. This year the Yankees played only two elimination games. They lost ALDS Game Four and went home. They got to the ALDS with a Wild Card Game win over the A’s. The club’s single biggest hit of the season — both sabermetrically and emotionally, I’d say — came in the first inning of that Wild Card Game. Against A’s opener Liam Hendriks, Judge clobbered a two-run home run that gave the Yankees a 2-0 lead in the winner-take-all game. Beyond putting two runs on the board in a winner-take-all game, that home run was also important because it showed up Judge’s wrist was healthy. Or healthier, anyway. Judge went 9-for-41 (.220) with one homer in 13 regular season games after returning from the disabled list and the homer didn’t come until his second-to-last game. Then he smashed that first inning homer in the Wild Card Game. At 116.1 mph, it was not only Judge’s hardest hit ball since the wrist injury. It was his hardest hit ball since June 4th, nearly two full months before the wrist injury. It was great to see. CPA: +0.019. By both measures, Sanchez’s walk-off home run against the Twins was the biggest hit of the regular season. That was win No. 6 during the 17-1 stretch. CPA and WPA are nice, it’s good to put a number on things, but big hits have a certain feel to them, know what I mean? To me, the biggest hit of the regular season felt like Gardner’s go-ahead triple against Kimbrel and the Red Sox. That was a wild back-and-forth game and Yankee Stadium had a postseason atmosphere in May. The place was rockin’. I can’t remember the last time a hit in May felt that important. And finally, if you’re a masochist and are simply dying to know, the biggest hit against the Yankees this season was J.D. Martinez’s three-run home run in ALDS Game One (+0.017 CPA). The biggest regular season hit was Justin Smoak’s grand slam against David Robertson (+0.004 CPA and +0.61 WPA) back during the first series of the year, when the Yankees intentionally walked Josh Donaldson to load the bases. That was far too much aggravation for the fourth game of the season. There are few things in baseball more enjoyable than a no-doubt home run. The crack of the bat, the hitter stopping for a moment to appreciate what’s he done, the pitcher either getting mad at himself or owning it, the crowd ooohing and aaahing … they’re great. Few things energize the crowd like an out-of-nowhere monster home run. This post is not about those home runs. We covered those homers earlier this week. This post is about the homers on the opposite end of the spectrum. These are the wall-scrapers. These homers generate a very unique feeling. These are the homers that keep you on the edge of your seat as you watch the ball in flight and wait to see whether it’ll land safely over the wall or stay in play. The thrill of the homer, the agony of the outfielder camped under it. Yankee Stadium is known to give up hilariously short homers from time to time. Sometimes the short porch comes back to bite the Yankees. Most of the time, it helps them out. Since the ballpark opened in 2009 the Yankees have out-homered their opponents 1,183 to 923 at Yankee Stadium. Quite the gap there. Let’s break down the team’s five* shortest home runs of 2018. * You’re getting a bonus homer free of charge, folks. The fifth shortest homer of the season is actually two homers tied at the same distance, so I’m including both rather than picking a favorite. I hope you’re all Miguel Andujar fans. You’re going to see him a bunch in this post. His 25th home run of the season — and his 67th extra-base hit — was one of those classic “what is he swinging at that pitch was out of the zone holy cow how did that carry out” Andujar homers. He seemed to hit a lot of those. This one was against David Price on September 19th. Landed a few rows back in right field.
? With that home run Andujar joined Aaron Judge, Joe DiMaggio, Bobby Murcer, and Joe Gordon as the only rookies in franchise history to hit 25 home runs. Gleyber Torres was one short of joining the club. Distance: 340 feet. Judge hit six homers in a ten-game span in late-June and early-July this year, and the fourth of those six homers was this short porch job in an interleague matchup against the Braves. Not a whole lot to this one. Anibal left a cutter up and Judge was able to reach out and drive the ball the other way.
? Doesn’t Judge make that look so, so easy? It’s not. If it was, everyone would do it. Those seemingly effortless homers are among my favorites, even if they are Yankee Stadium cheapies. Distance: 340 feet.
? If it were, say, 324 feet down the right field line at Yankee Stadium rather than 314 feet, does that make it out? Or does it slice just foul? I guess we’ll never know. Fortunately, it is 314 feet to right field, not 324 feet, and Romine’s home run put two runs on the board: Distance: 339 feet. Andujar hit 27 home runs this season and somehow only five were to the opposite field. Doesn’t that seem low? That seems low. I feel like Andujar did a good job spraying the ball around this year. I guess he did, but only so many balls to the opposite field left the yard.
? 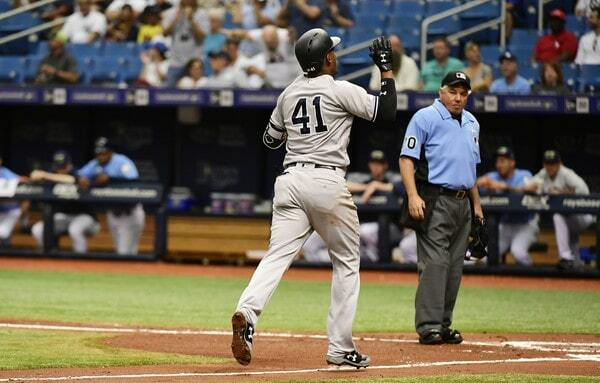 Big fan of Andujar’s helicopter follow through. This homer was not quite the full helicopter, but it’s close. This was the game No. 72 for the Yankees and homer run No. 10 for Andujar. He hit 17 homers in the final 90 games. Pretty good pace, that is. Distance: 399 feet. In an upset, the second longest home run by a Yankee this year was not hit in Yankee Stadium. It was hit in Minute Maid Park in Houston. In an even bigger upset, it was not Stanton’s little golf shot into the Crawford Boxes in left field. That homer somehow traveled 384 feet (? ), according to Statcast. No, the team’s second longest homer of the season was Stanton’s first homer of the game a few innings earlier. Keuchel left a changeup up a little too much and Giancarlo lined it into the right field seats for a two-run blast.
? I love it when the Yankees bring the short porch on the road. Most hitters poke that pitch the other way for a single, or maybe far enough away from the right fielder for a double. Stanton hit a laser into the seats. That is Not Normal. Distance: 339 feet. That’s right, the two shortest Yankees’ home runs this season were not hit at Yankee Stadium. Didn’t see that coming, eh? I’ve been doing these posts since 2012 and never before did the team’s shortest homer of the season come on the road, nevermind the two shortest.
? Fun Fact: The Rays cut out that portion of the wall in the left field corner so Carl Crawford could rob home runs back in the day. Then Evan Longoria hit a walk-off home run to that spot in Game 162 in 2011 while Crawford failed to catch Robert Andino’s liner in Baltimore, which sent the Rays to the postseason and the Red Sox home following their September collapse. Good times. Anyway, that ball left Andujar’s bat at 89 mph with a 30° launch angle. If I’m reading the Statcast breakdown correctly, batted balls with the same exit velocity and launch angle go for a home run only 2% of the time. The batting average on such batted balls is .087. Hit it anywhere else on the field, and it’s an out. Hit it down the line toward that little cutout at Tropicana Field, and it’s a three-run home run. Good times. Distance: 337 feet. As far as home runs go, the 2018 Yankees lived up to the hype. The set a new Major League record with 267 homers, and they did that despite Aaron Judge missing close to the two months, Giancarlo Stanton not having a typical Giancarlo Stanton year, and Gary Sanchez being either hurt or ineffective all year. This club would’ve shattered the previous homer record (264 by the 1997 Mariners) with everyone at full strength. Blame the short porch. The Yankees certainly hit some long home runs this season, as we’ll see in the bit, but they also hit a ton of short porch Yankee Stadium cheapies, which drag down their average home run distance. I will happily continue to trade average home run distance rank for actual runs on the board in games. The Yankees really know how to use their home ballpark. Anyway, dingers rule, and as a fan of dingers I’ve been putting these “five longest homers of the season” posts together since 2010. Last year’s post was an all-timer. Only one of the 35 home runs covered in the 2010-16 posts would’ve appeared in the 2017 post. This year isn’t quiet as majestic, but it’s still pretty fun. Let’s dive into the Yankees’ five longest home runs of 2018. On Opening Day, Stanton clobbered two impressive home runs in the Game One win over the Blue Jays. Five days later he heard boos at Yankee Stadium after going 0-for-5 with five strikeouts. Fans, eh? The next day, in the team’s sixth game of the year, Stanton hit the team’s fifth longest home run of the season to silence the boos.
? The first at-bat homer against likely AL Cy Young award winner Blake Snell was Stanton’s first homer at Yankee Stadium as a Yankee. (He hit one in the Bronx as a Marlin.) 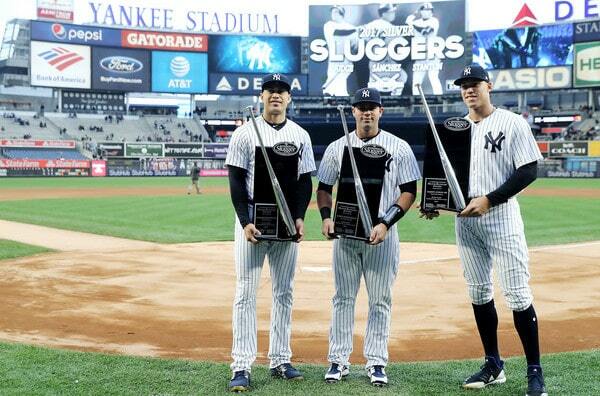 Also, that was the only game all year in which Judge, Sanchez, and Stanton all hit home runs. Happened once all year. Distance: 458 feet. Sanchez woke up on the morning of September 10th with a hideous .181/.279/.400 (84 wRC+) batting line in 308 plate appearances around two stints on the disabled list. He’d gone 3-for-25 (.120) with one home run in his first seven games back from his second groin injury, and while it’s somewhat understandable after the long layoff, it made it no less frustrating to watch. Later that night Gary had what we all hoped would prove to be a big breakout game (it wasn’t) against the Twins. Sanchez had a homer, a single, and a double in the span of three at-bats from the sixth through eighth innings. Kyle Gibson served up the home run that broke the scoreless tie. … that far out of the ballpark? That’s a 95 mph two-seamer diving down and in, and out of the zone. Sanchez was still able to get good wood on it and park it in the third deck at Target Field. Pretty wild. Distance: 460 feet. Two Orioles in the top five seems about right. Sanchez took Tomlin deep on May 4th for the 13th of those 25 home runs. It was the third home run Tomlin allowed in that game. Gleyber Torres and Judge took him deep earlier in the game, though neither hit the ball as far as Sanchez, who hammered a no-doubter to left. Another pitch out of the zone. The Gibson home run came on a pitch below the zone and the Tomlin homer came on a pitch above the zone. 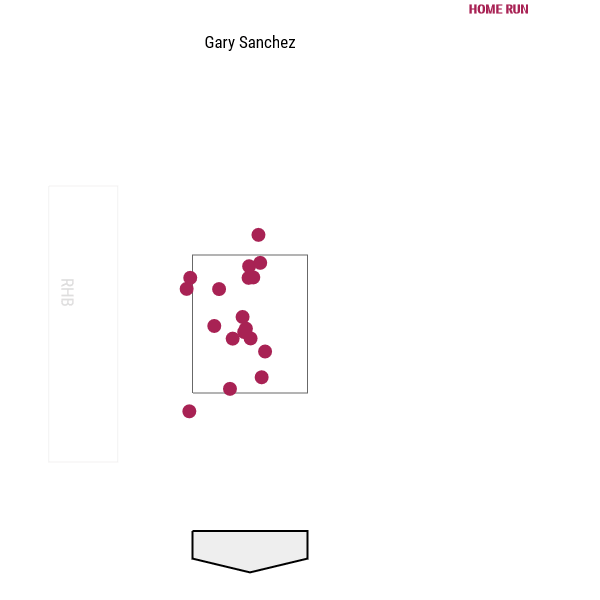 Oddly enough, those are two of only three (maaaybe four) home runs Sanchez hit on pitches outside the strike zone this year. (The third is the walk-off homer against the Twins.) Distance: 461 feet. Judge dominated this list last year. He hit five the team’s sixth longest home runs last season. This year, he hit only one of the five longest. Blame the wrist injury, which not only took away seven weeks of playing time, but also sapped his power a bit for the first few games following his return.
? Ah yes, that’s the good stuff. That’s the classic “oh yeah, I got all of that one” Aaron Judge swing followed by quick step out of the box and a jog around the bases. That was the sixth homer as part of an eleven-homers-in-29-games tear for Judge that spanned May 4th to June 9th. Distance: 471 feet. 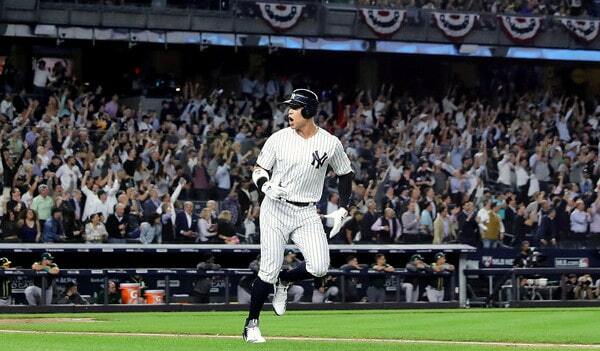 Plot twist: The Yankees’ longest home run of the year did not come during the regular season. It came in the postseason. It was the team’s longest homer of 2018 and also their last homer of 2018. At least it was one to remember.
? It’s hard to tell from the video but I’m pretty sure the ball cleared the big Fanatics sign and sailed out of Fenway Park entirely. Either way, Sanchez hit that ball out to the deepest part of the park and over the highest wall in baseball, and it was an absolute no-doubter. Second homer of the game for Gary too. 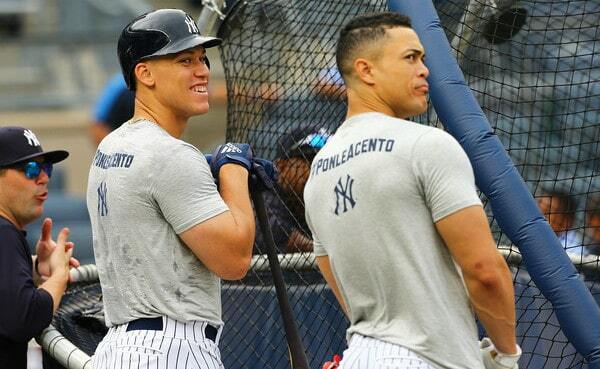 Without them, the Yankees probably get swept in the ALDS. Distance: 480 feet. Austin Romine? Austin Romine. We only have four seasons worth of data, but that is not Romine’s longest home run of the Statcast era. He blasted a 442-foot dinger back in 2016 (video). Huh. Well, anyway, the homers by guys other than Judge, Sanchez, and Stanton aren’t quite as impressive, but that’s okay. They all count the same. Long home runs sure are fun though, aren’t they?